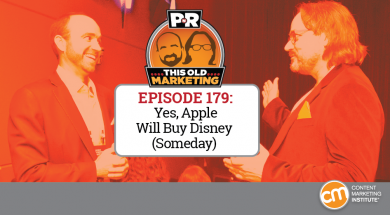 In this episode, we discuss the rumor spreading through Wall Street that Apple will buy Disney. We also explore Netflix’s newest billion-dollar business model and six publishing trends Reuters says brands need to pay attention to. Our rants and raves include an overly harsh critique of brand studios and the need to question your choices; then we close the show with an example of the week from Mint. PowerPost – Welcome to the Age of Power Publishing: As content marketers, we understand the importance of creating content that not only educates, but inspires consumers to take action. As a result, we have entered a new era of “brands as publishers” – where brands are increasingly becoming publishers in their own right. With brand publishing and content distribution come several key steps to the publishing process. But the elongated process of content creation, review, scheduling and tracking analytics can often take more time than we have. Built by marketers for marketers, PowerPost is a time-saving tool for companies who manage content for multiple brands with multiple users – whether it’s a regulated industry or creative agency. With PowerPost, your team can publish from one location across all of your online platforms, quickly and efficiently turning your brand into a power publisher. To help more brands excel at publishing, join us for a webinar on May 9th with CMI founder Joe Pulizzi. We have also created a comprehensive e-book, with insights from 50 experts in the content marketing field, and their strategies on conquering the five pillars of brand publishing: content planning, workflow, distribution, analytics, conversion. Claim your download at powerpost.digital. Wall Street wonders whether Apple is wishing on Disney’s star (11:55): Business Insider’s Markets site reports on the theory that Apple’s cash pile of more than $200 billion makes it a prime candidate to purchase Disney – a move that would solidify its position as a leader in the entertainment content space. There’s no telling whether either party is actively considering a deal, and Robert is skeptical. Yet, I’m just excited to see industry speculation catching up to PNR, as this is a topic we’ve been talking about since I predicted an M&A play between the two companies back in 2015. Does Netflix have a new billion-dollar opportunity on its hands? (22:02): Another Business Insider article caught our eye this week, which offers a discussion on the revenue-generating potential of Netflix selling merchandise based on its hit shows, like Stranger Things. The speculation is based on the company’s recent job posting for a head of licensing, which focused on how merchandise could be used to sustain interest in its shows. As I see it, Netflix has a number of valuable content brands on its platform that it isn’t fully tapping into. If the company wants to scale its growth even faster than it already is, Netflix should be asking, “How else can we monetize this audience?” Robert agrees, but also finds it fascinating that, culturally, we are still surprised when product companies look to add a media arm to their business. Six strategic lessons for publishers moving “beyond the article” (32:06): A post on theMediaBriefing summarizes a recent Reuters report that explores ways that news organizations are going “beyond the article” through tactics like distributed publishing, messaging apps and chatbots, virtual reality, and mobile-first video. What resonated most with me was the example set by conversation app company Quartz, whose Creative Director Brian Dell went on the record to say that the aim is not to marry commercial to editorial but, rather, to offer a great Quartz experience. The discussion also reminds us all of the value of thinking about what we might need to stop doing, so we can free up more time to innovate and deliver greater value to a very specific segment of our audience. Joe’s shout-out: A quick word of praise for our friend Craig Coffey from Lincoln Electric, who is featured in the latest issue of Crain’s Cleveland Business. 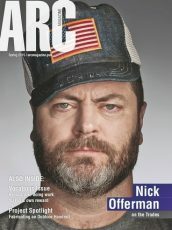 The Q&A interview includes a discussion about Lincoln Electric’s stellar content marketing effort, Arc Magazine. Among the many great takeaways here is Craig’s perspective on the need to rely on external writing talent: “Unlike us, they can get outside the conversation about our products … We want to entertain, educate, and inform. Then we can sell,” he says. Robert’s rave: Doug Kessler, a close friend of the CMI family, shared a recent content example from his company – Velocity Partners – that Robert feels is well worth raving about. The effort, The New Media Message: Why Innovation Stories Deserve Innovative Formats, highlights the need for storytellers to explore and play to the web’s unique strengths, rather than trying to squeeze innovative media ideas into old media formats. Robert’s rant: An Adweek article came to Robert’s attention via fellow Angelino, Doug Schumacher (@MemeRunner). The post takes branded content studios to task for operating under the belief that they can just, “render the creative, hit send on [the] programmatic buy, and win” in the content space. While he agrees with some of author Brian Tolleson’s points about valuing the skills, passion, and talent of creative professionals, Robert challenges his notion that agencies and entertainment studios have cornered the market on leveraging these attributes to create high-quality brand content. Digital personal finance software service Mint officially launched in September 2007 and, in just two short years, the company had amassed a following of over 1 million users, with a few thousand new users signing up daily. The company achieved this by establishing a content brand, MintLife, as a way to help its customers get answers to their personal finance questions. Mint initially built a strong following on a tight budget by inviting finance bloggers to contribute content, while also sponsoring other finance-related blogs – efforts which helped the company quickly grow its subscriber base to more than 20,000 consumers. Then, to continue to fine-tune the creative process in a cost-effective way, the company seeded its content on popular distribution sites, like Digg and Reddit. In an interview with Kissmetrics, Mint founder Aaron Patzer said that by the time MintLife was released, it was driving more traffic than their competitors were to their entire websites. And, according to an article on Contently, demand was so great, that Mint’s systems couldn’t initially handle all the subscribers who wanted to try its beta version. 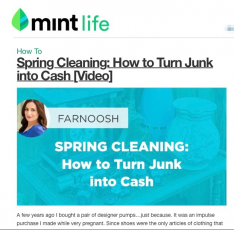 Mint responded by creating even greater demand, enabling interested subscribers to show their passion by posting an “I want Mint” badge on their blogs or social media profiles – efforts which helped boost the search ranking for MintLife content, and generate enough buzz to gain the attention of Intuit, which snatched up the young company in 2009 for $170 million. It’s a fantastic This Old Marketing example of how to establish a thriving business by using valuable content to build an audience.